This reporter, one JP Weiscarver, seems to be a nice enough guy. Then why is he continually stumbling across bodies? Why is it mysteries continue to find him? Maybe it’s because he’s so good at solving them. In “The Reporter and the Sloth,” the fourth of the series, JP is a guest among a band of hikers walking a near-abandoned trail outside his hometown of Oldport, located on the Gulf of Mexico. Things go south when they come across a recently deceased body. JP then starts turning up reasons others in the group might have wanted the victim dead. Meanwhile, his partner in crime solving, cops reporter Jennifer O’Hanlon, is pursuing the story from the other end while JP and his group are deep on the trail without communication. All of the JP Weiscarver mysteries are tightly written, character- and dialogue-driven stories worthy of a PG rating (that is, no cursing, no steamy settings and violence only as needed to create a mystery). The author likes to keep the story realistic with believable events and everyday people, drawing upon more than 20 years working in small daily newspapers like JP’s employer, the Oldport Odds and Ends. 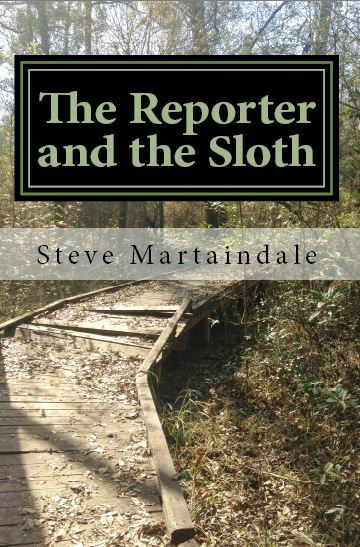 “The Reporter and the Sloth” is now available through Amazon in paperback by clicking here or on Kindle by clicking here. If you prefer doing business with your local bookstore (three cheers for you! ), the nice folks there should be able to order it for you, but maybe not right away. Interested in the first three books of the series? Here they are, in order. Any book stands alone, but those who read them in order have the additional enjoyment of growing along with the characters and their stories. If you’re just now hearing about “The Reporter and the Sloth,” you’ve missed out on some of the fun. For future stories, take part in their production. From the column to the right, either follow this blog, follow the author on Twitter and/or follow JP Weiscarver on Facebook and you will get the chance to participate in upcoming books by suggesting names and backgrounds of characters or taking part in other decisions along the way (often with the reward of a free book). You’ll also be among the first to know when Book 5 comes out. What’s the fifth book about? Follow along and you’ll know right after the author has decided.